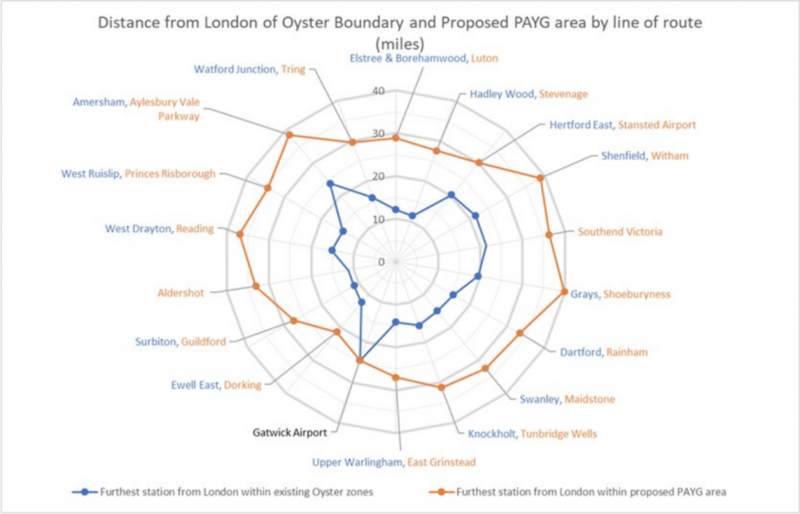 Up until now, Oyster Zone expansions outside of the Greater London boundary have happened in a piecemeal fashion. This has resulted in a very unbalanced coverage, with Gatwick Airport being included in the zone but not most of the commuter towns in northern Surrey. The new consultation, which you can access here, puts forth several proposals aimed at increasing the use of smart ticketing in the South East, simplifying the fare structure to make travelling more predictable and reliable, and increasing the size of the PAYG area to reflect the real size of London’s metropolitan area. As always, I highly recommend that all those interested submit a response for the consultation. The questions are very relevant, delving deep into possible changes in the fare structures, including fare caps, standardised fares among different operators, zonal fare, etc. However, personally, I was most drawn to the proposed PAYG travel area itself. Below, you can appreciate how this new area fixes the unbalanced nature of the current Oyster zone and now includes all of the major commuter towns that lie within proximity to the capital. As you can see, the proposed yellow area covers a much more balanced region. Extending out to all 5 of London’s airports and reaching key commuter centres such as Guildford and the Medway Towns, this zone provides a much more natural boundary for a London-based transport area. 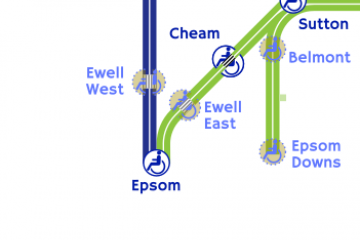 For example, all of the suburban routes for South Western, Southeastern, Thameslink, Southern, Great Northern, and Chiltern Railways are fully enclosed within this area. Even more impressive, the whole of the c2c network would be in the PAYG zone. Basically this means that the fare structure is simply catching up to the current state of suburban transport around London. Instead of having fully suburban lines, such as the Shepperton branch, where half the line is not available for PAYG usage, this proposal makes a clear distinction between the different types of services offered by operators. Overall, the roll-out of this PAYG area would effectively redefine the practical boundaries of London’s metropolitan area. There is additionally an alternative PAYG area that extends the coverage of some major cities located further away, such as Brighton, Oxford, and Cambridge. You can see this additional area below in orange. Immediately, I have serious misgivings about such a proposal because it is so unbalanced. If you can have Oxford, why not Ashford? And what about Basingstoke and Crawley? Also, the distances are just too far, with Oxford lying roughly half-way between London and Bristol! I think the original proposal is much more effective at identifying good boundaries where PAYG would be successful. Looking at this final graphic, 40 miles from Central London seems like a sensible cut-off point for PAYG. Finally, it is also important to add that these proposals are not just happening in the South East. Newly-created transport bodies like Transport for the North (TfN) and Midland Connect are planning their own integrated PAYG zone, with TfN aiming to launch a first phase in 2020. If these proposals are accepted, we can expect a MUCH larger step-free map in the near future!